Steel door frames offer a durable and functional option that will last for years in Newcastle. When it comes to industrial and commercial building projects, it is important to apply the proper support and security so the project is a success. One of the best installations for any industrial or commercial job is the use of steel door frames for added security and protection. At Spartan Doors, we can create high-quality steel door frames that provide maximum advantages and ensure security at any site. What are the advantages of our steel door frames? These frames are easy to install with proper safety precautions. They offer extra support and strength at masonry partitions, typically added before the build. Guaranteed protection in a number of applications. Reinforce security doors in any facility or industrial site. Reliable security for many projects. 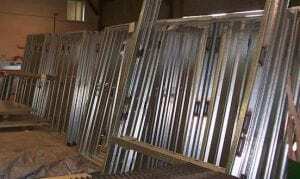 Steel door frames are resistant to rotting, warping, shrinking, and sagging. They are available in a variety of styles, colours, and finishes. Whether your application requires added structural security in a drywall partition after construction or you have an industrial building site that requires reinforced doors, steel door frames offer a durable and functional option that will last for years. At Spartan Doors, we offer a quick turnaround, the ability to supply for resale and distribution, and customisable options for your project in Newcastle, New South Wales. Contact us today to learn more about our steel door frames and specialised doors for your clients and building projects. Our knowledgeable staff is ready to assist you. Here at Spartan Doors, we offer double rebate steel door frames to help increase security at your home, office, or warehouse in Newcastle, Sydney, Melbourne, or Brisbane, Australia.